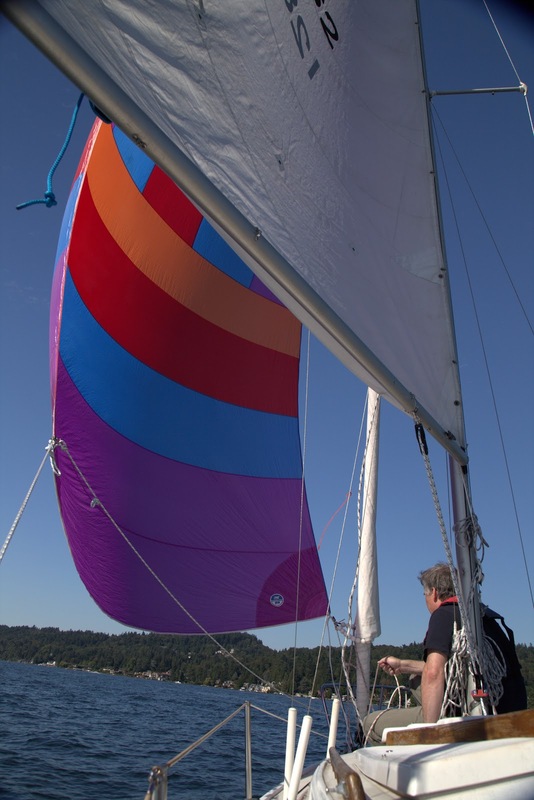 Catalina 22 with the gennaker (asymmetric spinnaker) flying. We went out for a sail with our Catalina 22 and flew our gennaker (asymmetric spinnaker) for the first time. Besides our normal crew, we took Sandi's oldest son, Devon, who shot all of the photos in this post. We left about 3:30 p.m. and got back in about 7 p.m. For the first part of the sail, things went pretty typical. We headed north up the lake with the wind coming from the south. We attached the lines to the gennaker, and raised it. On the third try, after fixing various line problems, we finally got it up. We lifted the sock, and it was out flying. With a few adjustments, we got it taking the right shape. 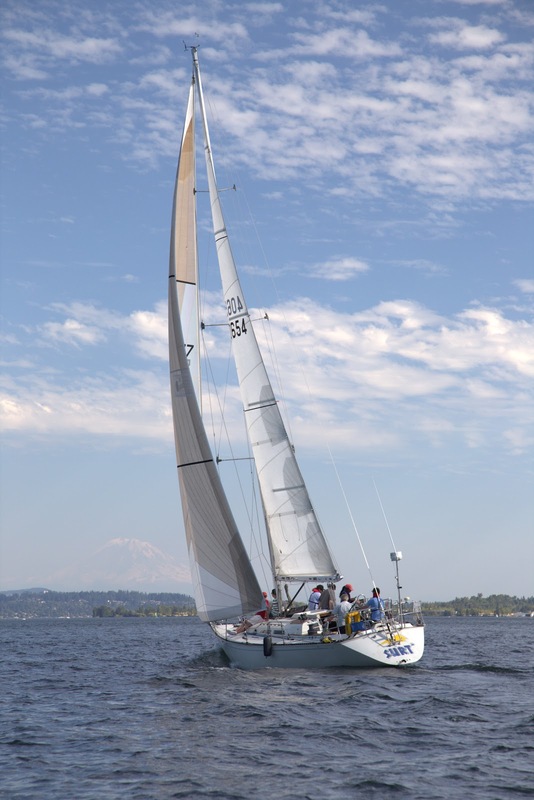 We use the same halyard, sheets, and downhaul as the symmetric spinnaker (see July 4th posting), but the one new rigging item is the parrel beads. We got ours from Neil Pryde Sails. 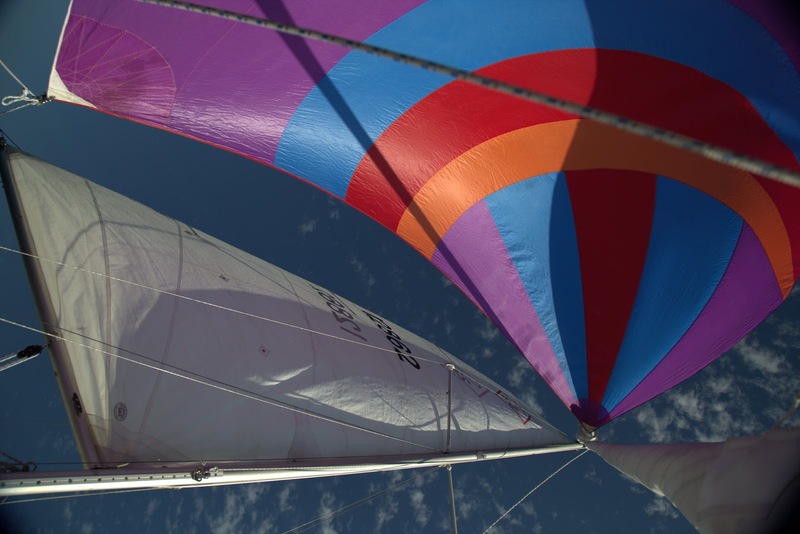 Parrel beads are a set of balls that go around the furling jib that allows the gennaker to move up and down and rotate without damaging it. We do need a way to keep the furling jib wound tight, though, to allow the beads to move. 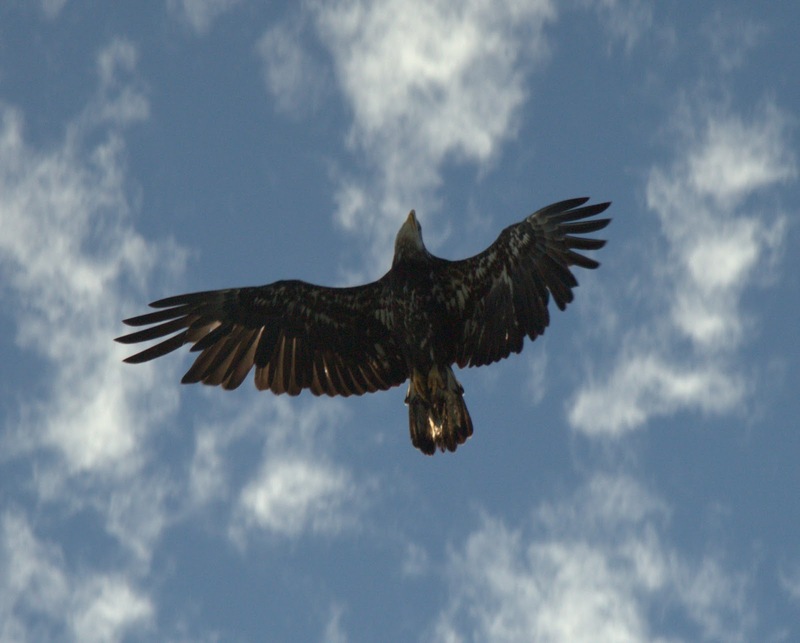 Circling around us was a young bald eagle, trying to fish. It was just getting its white head and tail. As mentioned in posts from last year, now there are quite a few bald eagles fishing on Lake Washington, and while the younger generation is used to seeing them, the older sailors view them like seeing a live dinosaur. As we continued to sail, a beautiful C&C 41 came along side us. 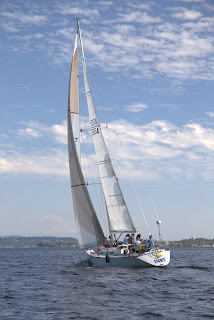 With so much more sail, we expected it to leave us in its wake, but with the gennaker out, we were keeping up. We doused the gennaker and headed back south. The C&C 41, eventually caught up. The captain challenged us, but we had to wave as it sailed away. 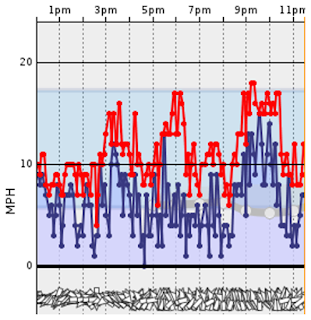 Wind speeds and directions at Sand Point. As we headed south, the wind picked up, and started radically changing directions. The chart of the wind speeds and directions around that time shows what we got ourselves into, with sustained winds of 2 to 12 mph, and gusting as high as 17. The wind was changing direction all over the place. 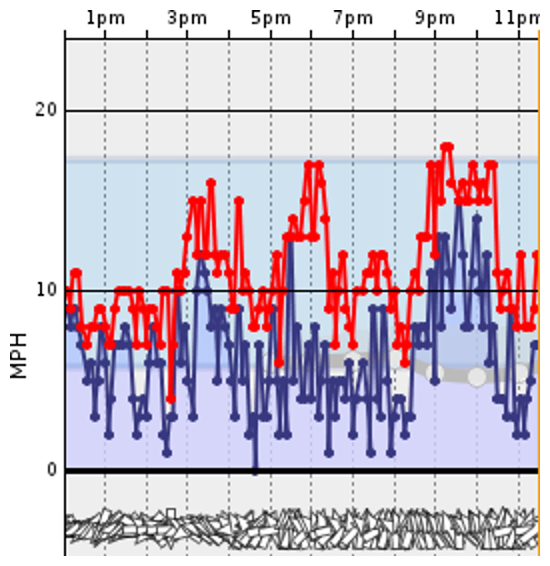 At one point, the wind radically changed direction, and gusted to 17 mph at the same time. It caught us unexpected, and Sandi had to fight a little to keep us under control. We finally headed into the dock. There were high waves, but the crew operated well and we got her docked.